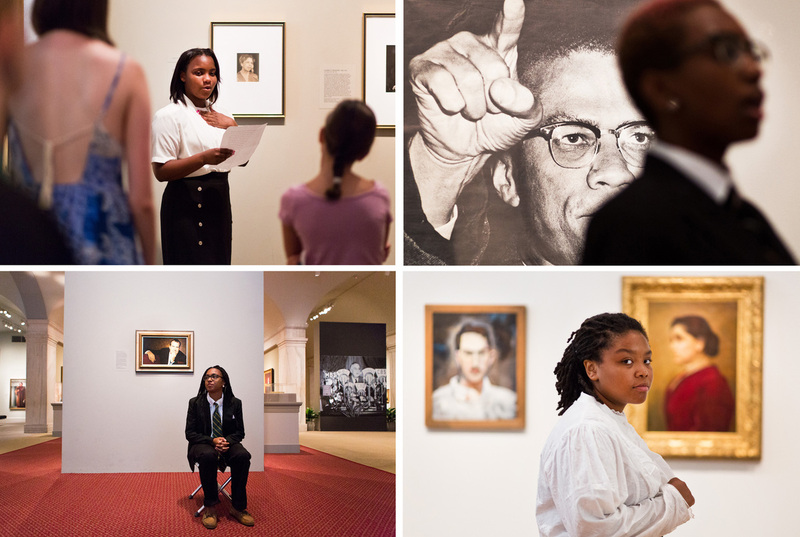 At The Portrait Gallery, Students Tell The Stories That Pictures Can't Washington, D.C., teens get into the spirit of historical figures and tell visitors what the portraits miss. In one instance, a student imagines a private talk between Richard Nixon and his wife. 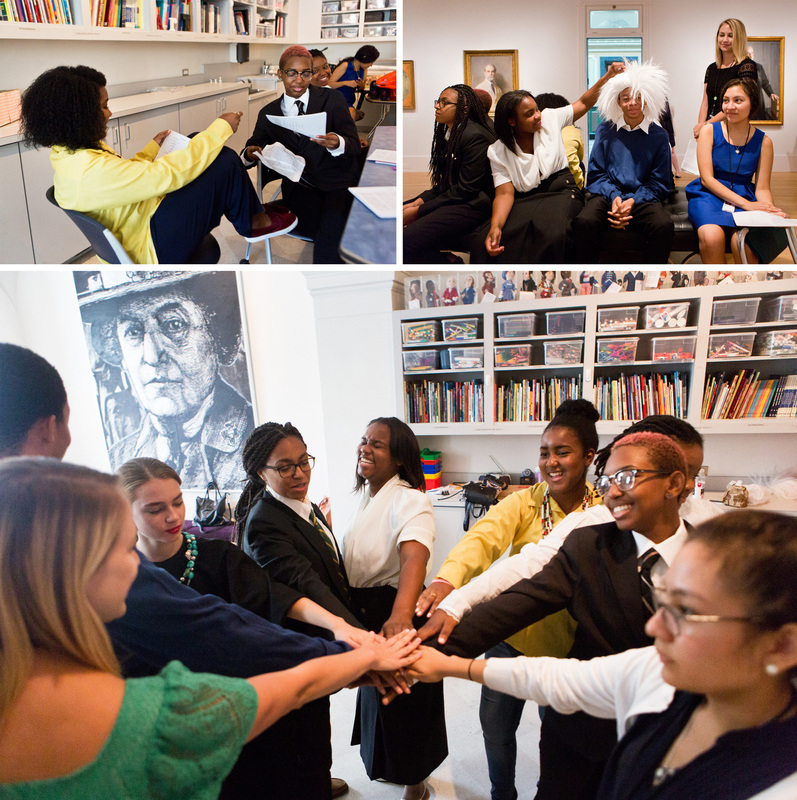 Five of the eight D.C. high school students participating in Portraits Alive! at the Smithsonian National Portrait Gallery. The students lead visitors on an interactive tour of the museum and perform original monologues. (From left) Daja Moorer as Jane Addams, Adjane Embrey as Eleanor Roosevelt, Kyla-Mechelle Petty as Malcolm X, and Daniel James as Albert Einstein. "We stand before you as a reflection of community," the group announces in unison. One after another, they speak up: "As reminders of social activists." "Some of us are leaders." "Or presidents." Then, together again: "All of us are citizens." 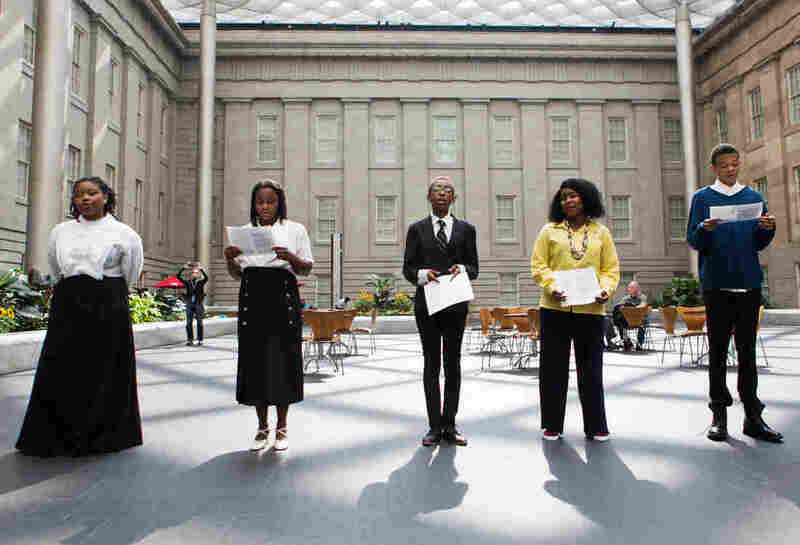 For the past 10 summers, the Portrait Gallery has assembled a group of Washington, D.C., high school students to lead visitors on an interactive tour of the museum's collection. Portraits Alive! unfolds as a series of original monologues, performed by the teens in front of — and from the perspective of — the figures inside the photographs and paintings. 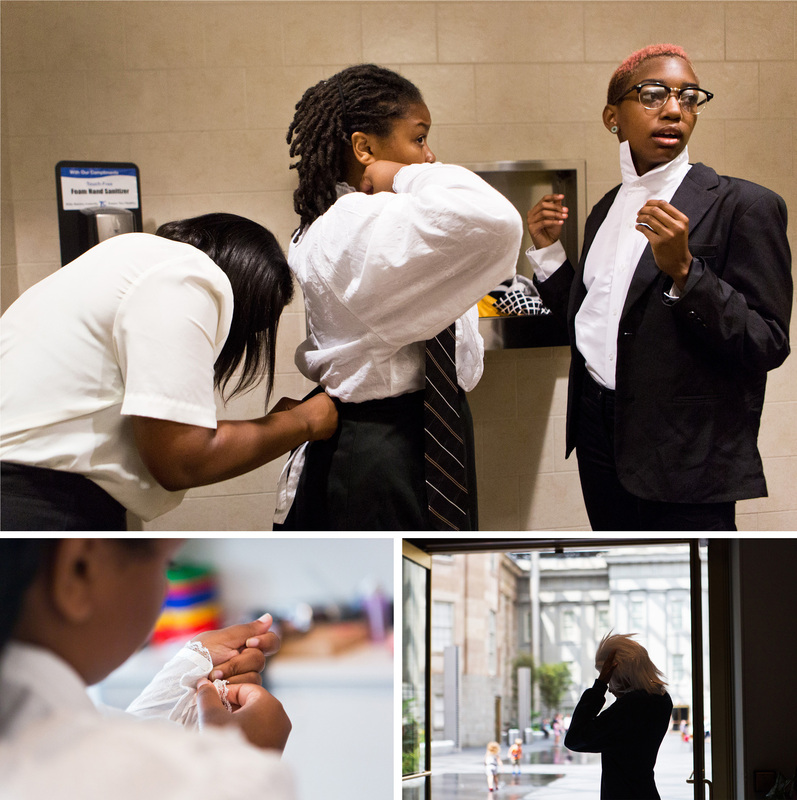 (Top) Adjane Embrey, Daja Moorer and Kyla-Michelle Petty help each other get into costume. (Bottom right) Daniel James puts on his Albert Einstein wig before a performance in the atrium of the National Portrait Gallery. The students chose historical figures to portray and write monologues based off of their research on the character. Dressed in a tight suit and Malcolm X's signature glasses, 18-year-old Kyla-Mechelle Petty walks in front of the crowd. She stands between a photograph of Malcolm X and a bust of Martin Luther King Jr. and begins to speak. "I am going to die," Petty announces. "I am not immortal, as none of us are, but I will not be fortunate enough to die of natural causes. I know I will be murdered." This intended contrast — between the picture of a dead man and the teenage girl talking in his place — lies at the heart of Portraits Alive! "It's not about standing in the frame of history and speaking exactly like the person or utilizing the same language," says playwright Tom Minter, who has helped oversee the program for the past three years. Rather, Portraits Alive! is constructed to help the students figure out how they personally relate to the figures, looking beyond biographical details to understand them as historical actors. "We realized that portraiture is so much about identity," says Rebecca Kasemeyer, associate director for education and visitor experience at the gallery. "It's so much about a personal story." Portraits Alive! began in 2006 in partnership with the Washington, D.C., Summer Youth Employment Program, which provides funding to some 12,000 young people in the District for paid work experience. (Top left) Amara Jerome and Kyla-Mechelle Petty help each other memorize their monologues before a rehearsal. (Top right) Adjane Embrey plays with Daniel James's Albert Einstein wig. (Bottom) The Portraits Alive! students come together before a performance. Over the six weeks of the program, each student explores the Portrait Gallery and selects the person they want to portray. They conduct research at the Martin Luther King Jr. Memorial Library — no reading from the museum plaques allowed — and, with Minter's help, write a monologue about the narrative they want to express. According to Blair Kirkbaumer, the gallery's teen programs coordinator, within the selected exhibitions there are no restrictions on what portraits can be chosen, other than the person must be deceased. "I say at the beginning, it doesn't matter what race, sexual orientation, gender — you can choose anyone in our collection, but just be open to the opportunity to tell their story," Kirkbaumer says. Each year, the choices are appropriately varied: Einstein and Malcolm X, but also Richard Nixon, Eleanor Roosevelt, Lakota activist Russell Means, cosmetics entrepreneur Helena Rubinstein, social worker Jane Addams, and transgender activist Sylvia Rivera. The monologues go through two iterations — after the students perform in the third week of the program, they rewrite the scripts to focus on a new theme, and then perform again three weeks later. (Top left) Adjane Embrey relates to Eleanor Roosevelt's struggles with public speaking. (Top right) Kyla-Mechelle Petty uses her monologue to humanize Malcolm X. (Bottom right) Daja Moorer chose to portray Hull House founder Jane Addams because of the mysterious nature of her portrait. (Bottom left) Aliyah Briggs imagines a conversation between Richard Nixon and his wife for her monologue. "It allows them to connect to what paradoxes and paradigms and challenges that these people had," Minter says. "And it is through that emotional connecting ... that allows a theatricality that is natural, as opposed to a show." For some students, like Adjane Embrey, 17, standing in front of an audience to embody a figure like Eleanor Roosevelt is an opportunity to learn from someone else's struggles with public speaking. 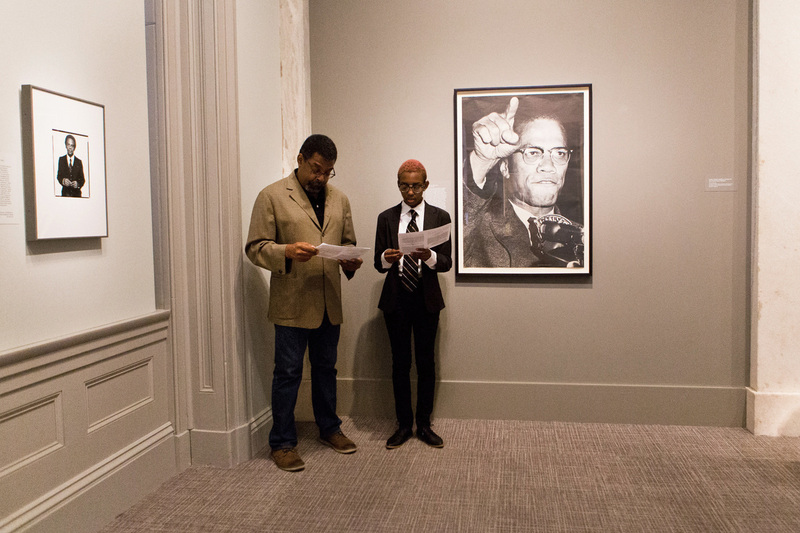 Daniel James, 16, says he never heard about Albert Einstein's civil rights activism until he started his research, and Irina Benson, 17, didn't even know Helena Rubenstein existed until finding her in the galleries. Meanwhile, Petty had read The Autobiography of Malcolm X in school and was more than familiar with his accomplishments. What she wanted, through her monologue, was to help humanize him. "I wanted people to realize that he's just a regular person and he has feelings, and that he cries and he laughs and that he's not just this angry militant person that you see all the time," Petty says. Surprisingly for a museum dedicated to portraits, the tour asks visitors to think past the two-dimensional pictures before them and consider what history has forgotten or left behind. Portraits Alive! 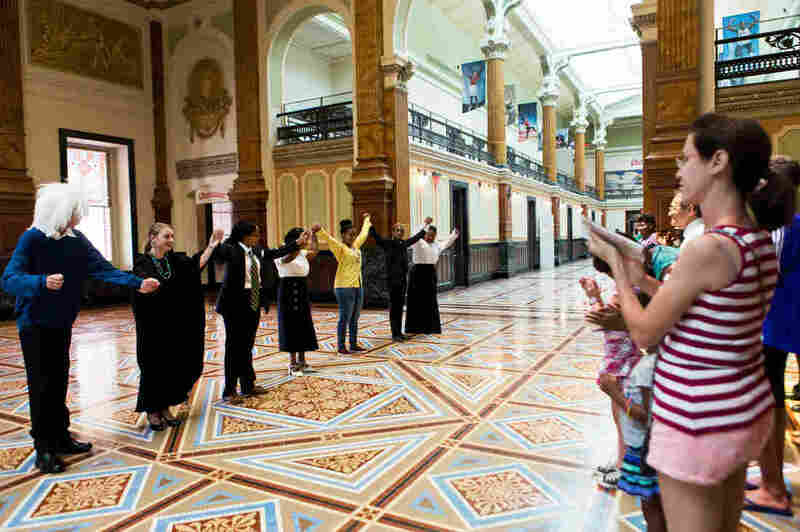 students bow to visitors in the Grand Hall of the Smithsonian National Portrait Gallery during the finale of their tour. As Richard Nixon, Aliya Briggs, 17, used the creative liberty of the project to imagine the besieged president's conversation with his wife. And Daja Moorer, 17, said she selected a Jane Addams portrait because of her mysterious facial expression: "You can kind of tell that she has something to say but she won't say it cause she's just like, 'I don't have to say it, you should know.' "
"I'm that type of person," Moorer says. Amara Jerome, 17, is a veteran of Portraits Alive! In her four years doing the program, she's played musician and activist Lena Horne, rapper Tupac Shakur, and tennis player Helen Wills Moody. But this year, speaking in front of Andy Warhol's painting of Russell Means, she reminds audiences that a single picture can never do justice to a life. "The person in this portrait could be a Hollywood star," Jerome says. "And I am. And I am more. Is that too complex for you?" The Portraits Alive! performances end Friday.